HEATWAVES dust storms, thundersnow and gale force winds are just a few of the wild weather events lashing Aussies. "Thursday was an incredible day of weather across the country," Sky News meteorologist Tom Saunders said. "We had severe storms across Queensland including Brisbane, we had emergency warnings for out of control fires across the Hunter district of New South Wales, we had damaging winds further south, dust storms and also heavy snow." Each of Australia's states and territories were hit with extreme weather events over the past few days with more adverse conditions ahead. Queenslanders are set to sweat through a week-long heatwave, which will start today and peak over the weekend with the mercury hitting well over 40C in many parts of the state. Proserpine in the Whitsundays will see its mercury hit 38C for seven days straight with the temperature forecast to hit 42C next Monday. The forecast is similar for Rockhampton - with five days hitting 40C, Moranbah - with the mercury hitting 43C, and Mackay - which will deal with a six-day heatwave and 50 per cent humidity which will make the temperature feel well over 45C. "An extreme heatwave is on the way. It is rare for areas on the Queensland coast like Cairns to hit 37C - that's their record for November - they're forecast to have 37C for four consecutive days," Mr Saunders said. "So an impressive heatwave for Queensland." The dust storm washed over southwest Queensland yesterday before hitting the southeast of the state this morning. Emergency services issued a health warning for today and tomorrow reminding residents to stay indoors. While parts of Queensland brace themselves for the drought-induced dust storm, the massive weather system that threw a blanket of dust over Sydney is set to generate more unusual conditions across NSW. 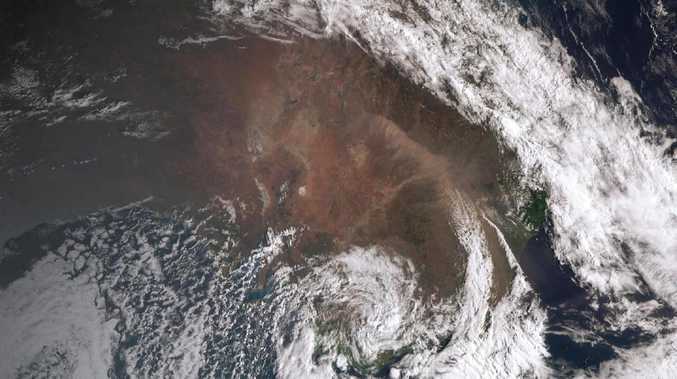 The band of dust - which stretched more than 500km and was visible from space - started in the state's west and travelled east, hitting the Australia Capital Territory on the way. The Bureau of Meteorology issued a severe weather warning for damaging winds over the state's southeast - stretching from the Victorian border up to the Hunter Region. Gusts of more than 90km/h are expected, and possible blizzards in the Alpine areas. Sydney Airport has been restricted to using only one runway, which is already impacting travellers leaving and arriving in the city. "International and Domestic terminals are experiencing some flight delays. Please contact your airline for more information," the airport tweeted on Friday morning. Qantas flight QF12 from Los Angeles was forced to abort a landing at Sydney Airport this morning due to strong winds. The airline is warning passengers of delays, as is Virgin Australia. Thousands more passengers have been left stranded at the airport. "Sydney and Melbourne Airports have reduced the number of flights allowed to arrive and depart each hour, which is impacting all airlines," Virgin said in a statement. "This may also affect flights arriving and departing into other destinations across the network." 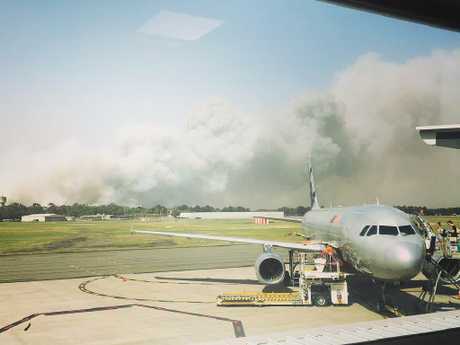 The strong winds are also whipping up bushfires near Newcastle airport, threatening a number of homes. An emergency warning has been reissued for the blaze at Campvale, which is moving towards Rookes Road in Salt Ash. The NSW Rural Fire Service said fire activity had increased on the northern side of the fireground, while the southern front remained uncontained. 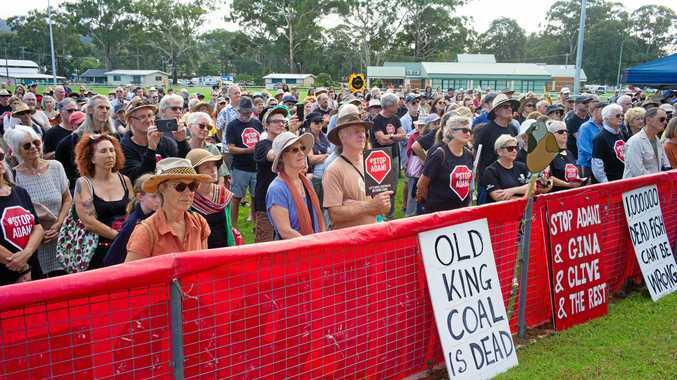 "It is threatening properties at the moment," RFS Deputy Commissioner Rob Rogers told the ABC. Residents are being told to stay put, while several roads in and out of the area have been closed. Strong winds are expected to continue in the area throughout the day. "They are already getting gusts of up to 50km/h - that is expected to increase to 80km/h," Mr Rogers said. "It will be a very tough day for our firefighters." More than 200 firefighters spent the night battling the blaze, which has already burnt through more than 1300 hectares. Winds in Canberra are also expected to hit 50km/h. As Sydney and Melbourne deal with gale force winds and flight delays, other parts of Victoria received a rare dumping of November snow. Despite being a week away from summer, the snowfields in Victoria and southern NSW were hit by thundersnow. "Under very rare circumstances, if the mid-levels of the troposphere are exceptionally cold and even temperatures at the surface are below freezing, it can lead to rising air," Sky News meteorologist Tom Saunders said. The thunder-snow phenomenon is extremely rare, occurring only once or twice a year. Mount Hotham received a dumping overnight with 37cm of snow already seen across the higher peaks. 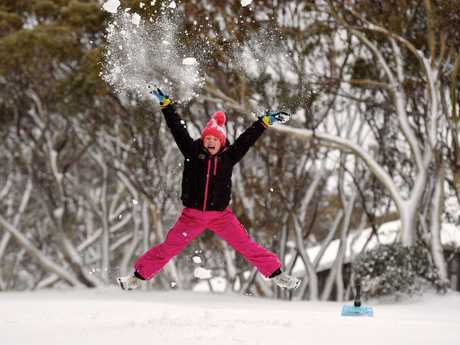 Heavy snow will continue over the weekend just before Aussies head into December. Gale force winds are also expected to hit Victoria with the Bureau of Meteorology issuing a weather warning to sheep graziers across the state. "Sheep graziers are warned that strong and gusty south-westerly winds, cold temperatures and showers are expected during Friday," the Bureau said. "Areas likely to be affected include the Central, West and South Gippsland and East Gippsland forecast districts and parts of the North Central, North East and South West forecast districts. There is a risk of losses of lambs and sheep exposed to these conditions." A low pressure system coming from the west will bring showers and potential thunderstorms to South Australia a day after a huge storm cell left more than 40,000 homes without power on Wednesday night. Three similar low pressure systems will form off the coast next week, potentially affecting South Australians again. Yesterday, SA Power Networks sent hundreds of crew members out to attend to tens of thousands of customers who were dealing with blackouts. Over Wednesday and Thursday, the power company attended to more than 100,000 South Australians dealing with outages. A low pressure system coming from the west is also going to bring showers to Western Australia and South Australia over the coming week. WA is also facing catastrophic bushfire dangers as the system whips up strong winds. Fire warnings are in place for parts of the state and adverse conditions are expected to last a couple of days. Over the weekend, the system will start to move down to the Great Australian Bight, bringing cooler temperatures to Perth and a chance of showers. By mid-next week, the mercury will almost hit 30C as Australia moves into summer. A deep low sitting in the southern Tasman Sea means most of Australia's south and east capital cities are going to have a wet and windy weekend. "Those strong winds and cold conditions will continue for our south east capitals," Mr Saunders said. "The winds are very strong but that low will weaken and move away from the coast over the next few days so conditions from late Friday onwards will ease back." There's a chance of showers in Hobart for the next week with the conditions easing mid-next week after a wet weekend. The Northern Territory was also lashed with thunderstorms with more expected today and over the weekend. The mercury has already hit 30C today with the temperature expected to hit the mid-30s over the weekend and into next week. Darwin will have its hottest days on Monday and Tuesday where the mercury will hit 35C.